I read the Dragonlance books as a teenager and am, even as we speak, playing through the AD&D Modules. I was dead excited to hear there was a film and even enjoyed watching it for the first ten minutes. It begins at a quite relaxed pace, introducing the characters with some humorous banter and bloodless action. But this is soon replaced by break-neck pacing. The plot feels as if it is on fast-forward, with a lot being told in exposition and chunks of the story being missed out altogether. With a large cast of characters they get no more than a handful of lines each, and several are left standing around with very little to do. Ultimately 90 minutes just isn’t a sufficient run-time to do the story justice. 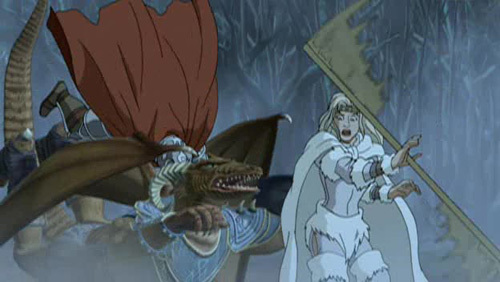 The animation is mostly 80s style 2D, with the jarring addition of 3D CGI for the Dragons and Draconians. The two styles just don’t mesh and make the production look amateurish. The bloodless action is replaced by amazingly inconsistent gore. One moment we are looking at Hobgoblins dying in pools of blood, the next the ground is perfectly clean! Continuity errors like this persist throughout the film, almost every time the viewpoint changes, and their lip-synching is about as good as mine! So I was enormously disappointed and appalled to think that this might be anyone’s introduction to Dragonlance. So do yourself a favour and don’t let this film ruin what could be a wonderful experience. Read the books.